Apple's current account base of 500 million users is growing and spending at a tremendous rate, suggesting to one analyst that new services such as mobile payments or streaming radio could be key to the company's future growth. Apple's half-billion registered users with active credit cards one of the largest and fastest growing bases among technology companies. In fact, according to data compiled by Morgan Stanley, Apple is only second to Facebook in total number of user accounts as of 2012. The 500 million active Apple accounts are more than double the 200 million active users registered with online retailer Facebook. 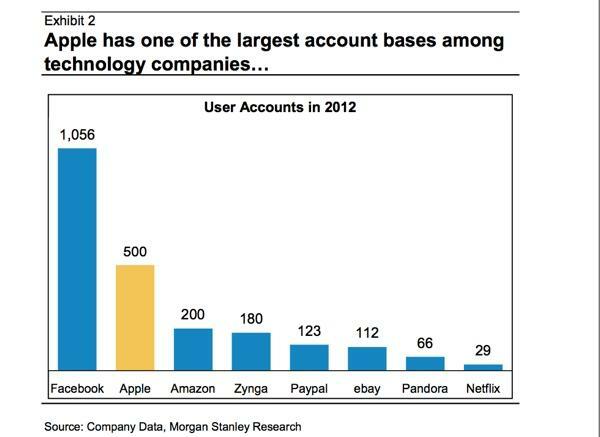 In 2012 alone, Apple saw its account base grow an estimated 55 percent. In terms of revenue per account, Morgan Stanley found that Apple generates an average of $329 per user, which puts it in first place among technology companies, ahead of Amazon's $305 per account, and well ahead of eBay's third-place $125. And analyst Katy Huberty expects that Apple will reach 600 million users with active Apple IDs this year, extending its lead over rival platforms such as Amazon. She believes that rather than owning content or apps, Apple will instead roll out new platforms that, in the same vein as iTunes and the App Store, leverage content from others. As for potential ways Apple could monetize its large user base, she believes mobile e-wallet payments could be tied to existing credit card accounts registered with iTunes and the App Store. But instead, those cards could be used with an iPhone to authorize purchases at brick-and-mortar stores, in place of a physical credit card. She sees the potential inclusion of a fingerprint sensor in Apple's next iPhone, a feature that has been rumored since the company's purchase of AuthenTec, as a step that could set the stage for e-wallet payments on the iPhone. Morgan Stanley's Katy Huberty believes Apple could generate more than a billion dollars per year with an "iRadio" service through its current install base. Another potential use of Apple's existing customer base is a new streaming music service  something the company is also rumored to be working on. This week it was reported that Apple has inked a deal with Warner Music Group for its so-called "iRadio," setting the stage for the launch of a Pandora-like streaming service as soon as next week's Worldwide Developers Conference. With its current user base of 500 million, Apple could generate as much as a billion dollars of annualized revenue through an "iRadio" service, Huberty estimates. Her figures are based on the assumption that penetration of iRadio would range from 40 percent of the install base (which is how many current Apple users are registered with Game Center), and 50 percent (which is how many have iCloud accounts). 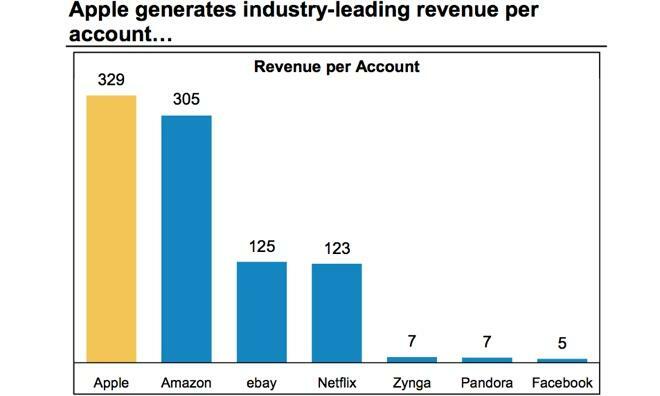 Pandora's revenue per user in 2012, excluding audio ads, was $4.42. Using a similar figure, if 40 percent of Apple's current install base were to adopt iRadio, it would generate $883 million in revenue per year, while a 50 percent penetration would mean $1.1 billion. Finally, Huberty also suggested that Apple could leverage its existing iAd platform to create an ad exchange service. This could allow developers to charge higher rates than for ad impressions on other, non-Apple devices. "Users benefit from potentially lower pricing for apps and services if developers make some of their money from ads," she said. "The ad experience could also be a lot better as the design and relevancy of ads improve. They could become more tasteful (like fashion magazines) rather than annoying (many ads in Web browsers)." Morgan Stanley has maintained its $540 price target for AAPL stock, but its "bull case" scenario, with a price target of $670, reflects upside potential from new services.